For today, a few links to interesting websites related to North Caucasus. To begin with, a collection of photos from Dagestan, dated 1933. Don’t miss – those are very exciting! 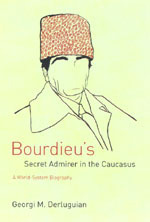 ‘Caucasus United’: an e-library holding books, movies, and photographs from various parts of North Caucasus, from Karachayevo-Cherkessiya to Dagestan. Library per se it’s the website’s richest resource: it contains lots of fiction, magazines, newspapers, academic publications, archival materials, literature on culture and arts, Islamic literature, etc. ‘The Cossack Army of Kuban’’. A website dedicated to the Cossacks of Kuban’. Here you can read Cossack newspapers and other media, learn about Kuban’s history and geography, browse the archives or look through the news. ‘Prague Watchdog’ – a Czech website dedicated to ‘reporting on the conflict in the North Caucasus’. Covers topics such as political situation in the North Caucasus and its coverage in international media, as societal, environmental, and military issues – all with a strong focus on human rights. ‘Prague Watchdog’ is a partisan organization: it functioned from 2000 to 2010 through the support of US-based National Endowment for Democracy. The website holds unique materials such as, for example, interviews with Movladi Udugov or Dokka Umarov. Highly recommended for all those interested.